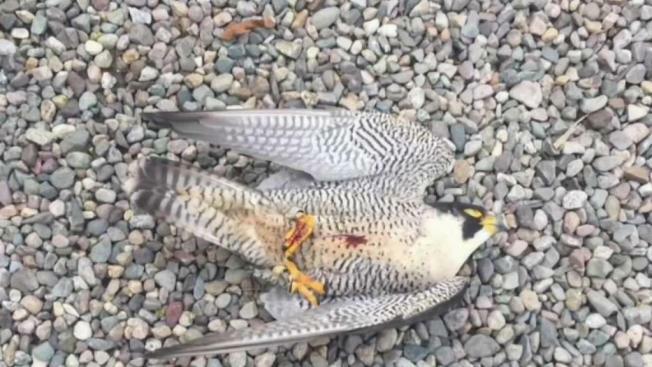 Police are looking for the person who shot and killed a falcon in Salem, New Hampshire. Police are searching for the person who shot and killed a federally protected falcon in Salem, New Hampshire. Authorities said an officer responded to a home on Twinbrook Avenue Saturday afternoon for a report of a dead peregrine falcon after the homeowner found it on his property. With the help of New Hampshire Fish and Game, authorities determined that the falcon had been shot, likely by a .22 caliber round. The falcon was believed to have been shot while perched in a tree. The bullet was not found. Police said the bird had tags by U.S. Fish & Wildlife Service for tracking purposes. Authorities say peregrine falcons are a federally protected species under the Migratory Bird Treaty Act. The shooting of the falcon is considered a crime. Anyone with information is urged to contact Salem Police at 603-890-2390 or New Hampshire Fish and Game at 603-271-3127.